Order Booja Vanilla Ice Cream from the Online Health Food Store UK. Buy Booja Booja Dairy Free Keep Smiling Vanilla M'Gorilla - 500ml and other quality Frozen Foods safely online in the UK. Made with nuts, not dairy. Booja Booja is a delicious alternative to dairy ice cream: sublimely creamy vanilla made with some of the finest vanilla in the world Dairy free, gluten free, vegan and vegetarian ice cream. Delicious dairy free ice cream made with nuts instead of milk (dairy). Pure water from reverse osmosis, agave syrup (contains 74% fructose with low GI raw), cashew nuts, vanilla oil 0.1% fine bourbon vanilla. As official Booja Booja stockist in the UK, we sell quality Frozen Foods to customers throughout the UK in England, Wales, Scotland and Northern-Ireland. Booja-Booja's dairy free chocolates are beautifully, melt-in-the-mouth truffles made only the finest and purest of ingredients. Not just for dairy intolerance, tasty for everyone! View more products on the Online Health Food Store from Booja Booja. Where to buy Booja Vanilla Ice Cream safely online? Shop at the Online Health Food Store if you are wondering where you can buy Booja Booja Dairy Free Keep Smiling Vanilla M'Gorilla - 500ml safely online in the United Kingdom. Our Health Shop is located in the UK and our award-winning independent has been serving customers in England, Wales, Scotland and Northern-Ireland since 1976. You can buy our Dairy free chocolates and other quality Frozen Foods online and we post out orders to any UK address. 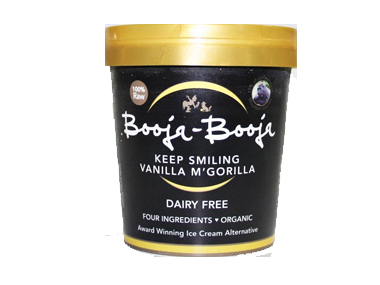 Booja Vanilla Ice Cream - Booja Booja Dairy Free Keep Smiling Vanilla M'Gorilla - 500ml in Frozen Foods and Foods.